Channel your inner fashion editor with this luxurious and functional shoulder bag by Marc Jacobs Handbags. 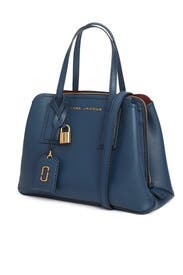 Blue sea pebbled leather shoulder bag with gold Marc Jacobs front logo. Three spacious interior organizational sections and one zipper compartment. 15"L x 11" H x 5" D.